phuket | eat. drink. cook. travel. 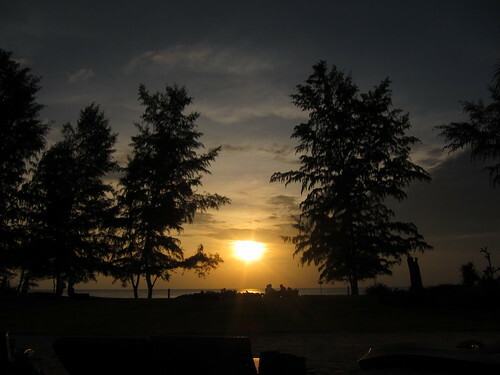 There wasn’t a great deal else to do in the Mai Khao beach area, which was exactly what we wanted – to have nothing else to do aside from lie on the beach or lie by our private pool or lie by the main pool. Thankfully, the hotel provided some complimentary bikes for our use and we ventured out for a jaunt. The Renaissance was the last resort in the area and further down was nothing but dirt tracks leading to villages in the area. 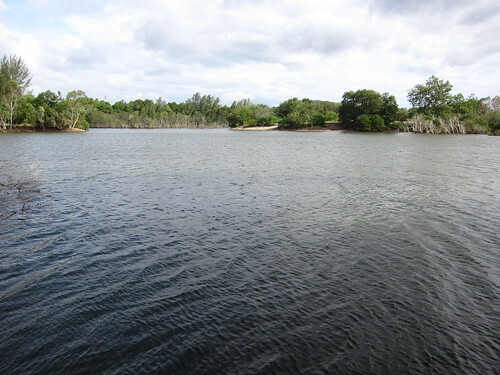 It also circled round a large pond, so large that by Singapore standards, it would definitely be called a lake or at least a reservoir. We had a good workout for our unfit bodies getting round that lake. But seeing nothing much else, we headed out to the main road. Near the main road was a mini shopping complex that had nothing interesting at all except a minimart at the basement that was a convenient source of cold drinks. We rode on to the main road and soon found ourselves pretty much in the middle of nowhere. 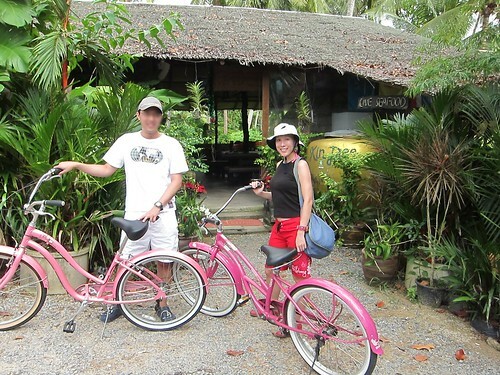 About a kilometre or so down the road (turn left at the main road and go along with the traffic), we saw the turning into Kin Dee and trotted quickly across with our bright pink bikes. We got to Kin Dee in one piece and have the evidence to show for it! 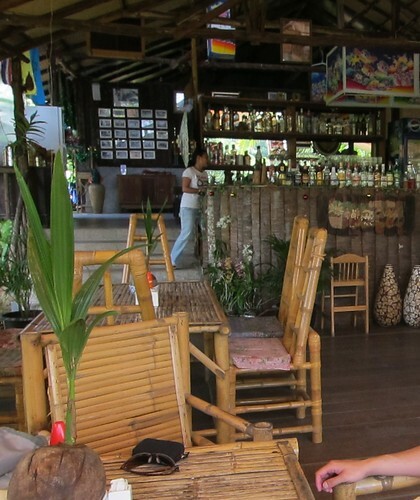 It’s quite charming inside, everything seems made by hand from bamboo poles, even the bar that seemed to be groaning from the sheer number of bottles on it. 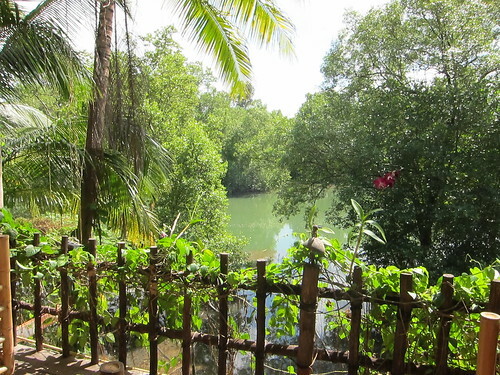 The restaurant overlooks something that seemed like a river but was probably more like a mangrove swamp considering all the insects in the area. It was a really lovely view, worth going once to check out in the day time, but no more. The restaurant staff are very aware of the issue and provide a bottle of insect repellent spray on each table! If you’re fussy about what brand you use, be sure to lube up before heading there. It also helped a lot that the staff helpfully set up a fan pretty much blowing directly at us so that we could enjoy our food without the insects. The food at Kin Dee was very well prepared. 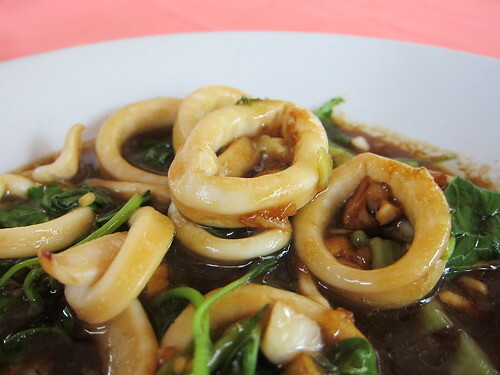 The ingredients are fresh, cooking techniques are faultless and the flavourings well-balanced and restrained. 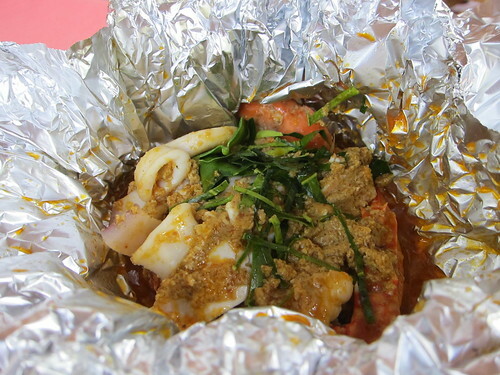 It’s not quite royal Thai cuisine, yet not street-style. I’d call it middle class cooking. 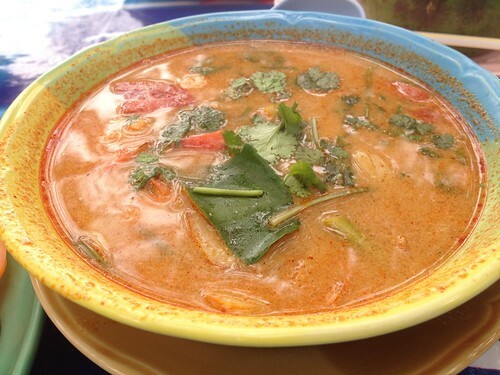 I loved the shipwreck soup (120 baht or about S$5 for small). 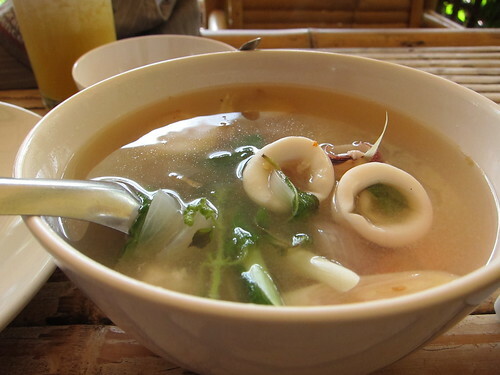 It was somewhat like clear tomyam soup, except far more herbal with strong notes of holy basil interspersed with the familiar lemongrass and shallot. 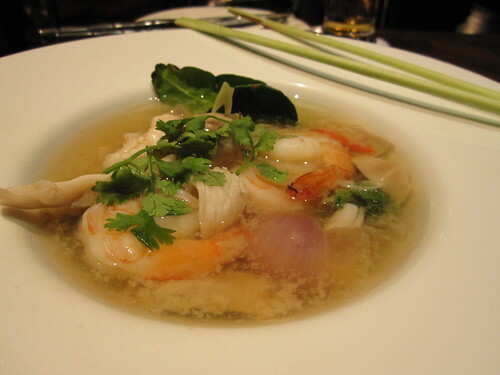 The seafood was very fresh and I finished every drop of soup. 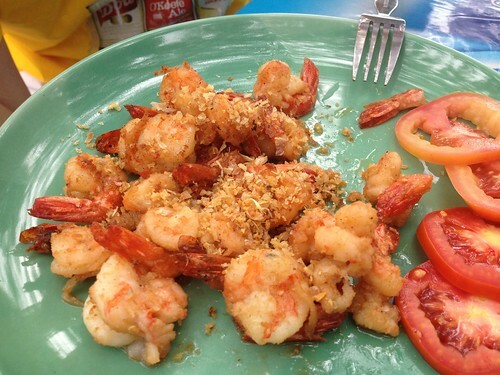 The grilled jumbo sea prawns (490 baht or S$20) were not bad, though somewhat pricey by Thai standards. By Singapore standards, they were very good value. 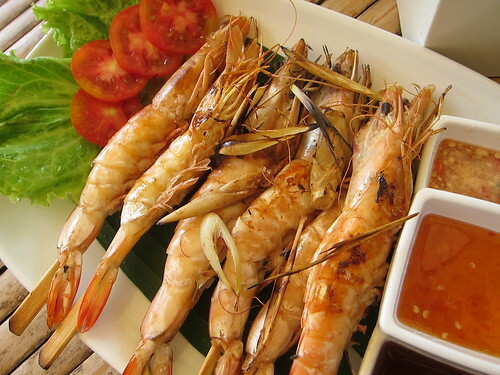 DC was slightly disappointed that the prawns weren’t as big as they used to be when he visited Phuket 20 years ago. I found them fresh and sweet and good. They hardly needed any sauce, but if you need, there was a selection of dipping sauces provided. 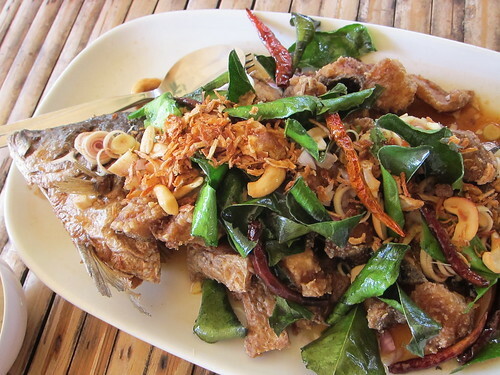 The Kin Dee Signature Fish (490 baht or S$20) was excellent. There certainly was good reason for this to be signature as the fish was deboned and the chunks deep-fried till really crisp, along with the bones. It was crisp enough to crunch up bits of fin too, which I enjoyed very much. 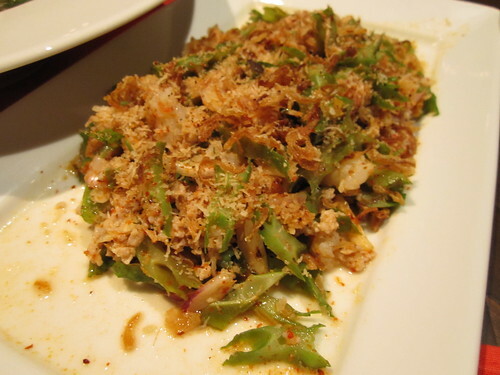 It was topped with diced fresh herbs – lemongrass, shallots and galangal, and topped with fried kaffir lime leaves, shallots, chillis, then slathered with a tangy sweet tamarind sauce. Good stuff! Too bad it was just the two of us, we definitely wanted to try out far more dishes here. 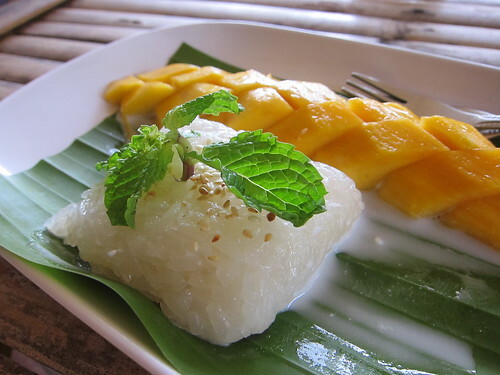 We only had room for dessert and had a pretty credible mango sticky rice (90 baht or S$4). It was of the right standard since the rice was cooked right and the mango was decent though could have been sweeter. Overall a good end to the meal. The best part about Kin Dee is that they do deliveries. Get the menu from its website or grab a takeaway menu. The prices are the same as dining in the restaurant. So avoid the bugs and call to get it delivered straight to your hotel. They of course also provide plastic cutlery and serve in plastic boxes so there’s no problem if the room doesn’t have cutlery and plates. We had that for one of our dinners and were very happy with our choices. 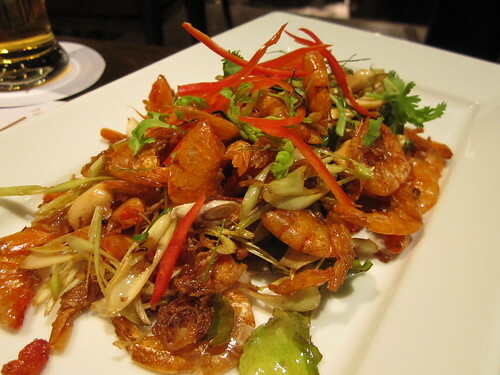 We had the Phuket crispy shrimp on wild pepper leaves tempura (150 baht or S$6), which was essentially fried dried jumbo shrimp with green leaves in a batter and covered in a light sauce similar to the sour-salty-sweet-spicy one for papaya salad. I liked how they separated the deep-fried items from the sauce so that it wouldn’t be soggy by the time it got to us. I insisted on the shipwreck soup yet again and it was as good as the first time. We also have the quixotically-named “Let’s have Kin Dee duck quak.. quak…” (290 baht or S$12) which was essentially duck pieces stirfried with a chilli spice paste, holy basil and green peppercorns on the stem. Green peppercorns on the stem are one of my favourites of Thai food – so hard to find outside of Thailand. I like how the soft peppercorns crunch open with a delicate pepper aroma and get hotter and hotter as I chew through the many on the stem. Seems like they do cooking classes too, so seems like a fun thing to do if you’d like to do something other than lie on the beach or bike around. DC and I took a long weekend off to recharge. 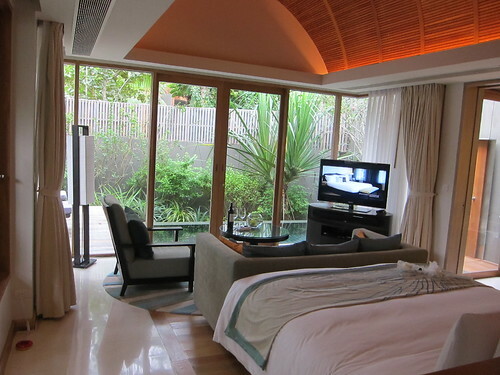 We chose the Renaissance Phuket based on excellent reviews about this modern hotel that had great service. 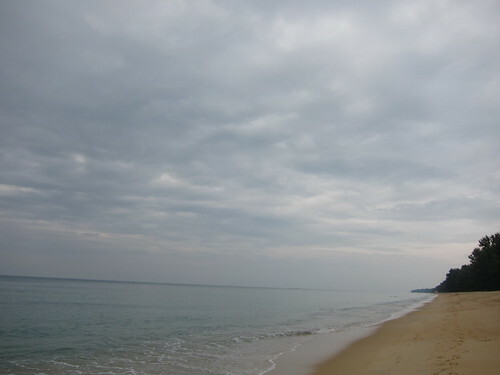 It’s on Mai Khao beach on the north of Phuket island, near the airport. It’s far less touristy in the area, but whatever there is that caters to tourists tends to be more expensive because there are only the Marriott group properties and a handful of other resorts in the area and not much else. 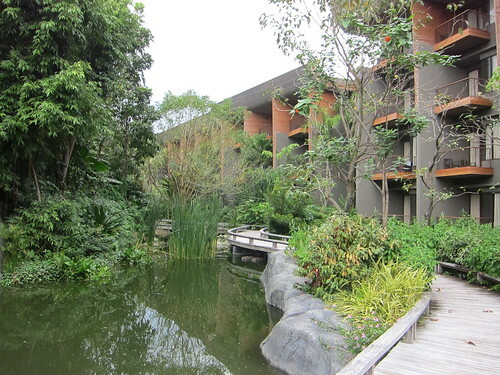 The great thing about staying at the Mai Khao area is that the airport is minutes away. It was a very easy check-in complete with ice-cold ginger and pineapple punch and cold towels. I liked how the reception area was wide open, with a grand water feature drawing the eye to the rest of the resort below. It was a very clever bit of design to make use of the height difference between the reception and the beach and I loved the landscaping with the many coconut trees dotted everywhere. The grounds below were equally beautiful and we enjoyed walking around the compact resort admiring the ponds and the greenery. 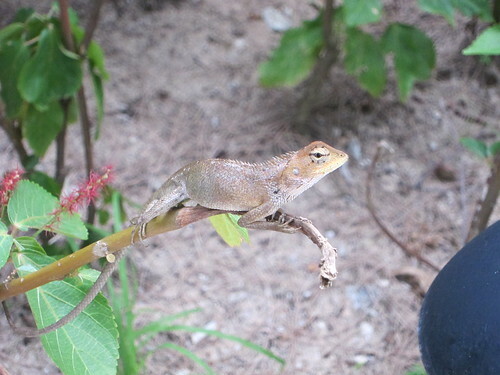 It was so relaxing that even this tree lizard stopped for long enough to let us take a good shot before scarpering off! 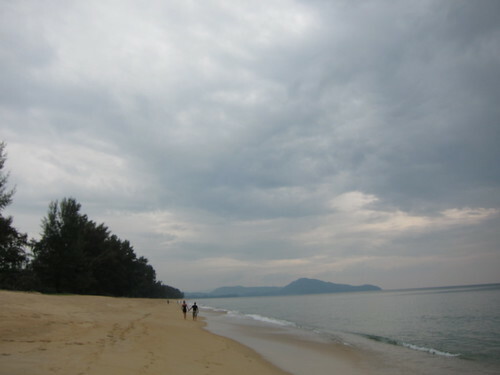 The beach itself is quite nice, though not the best. It’s a long expanse of yellow sand that’s a bit on the coarse side. Be careful when going in the water because there’s a steep dropoff rather early on. It’s definitely not safe for kids unless you’re in the water very close to them. But walking on the beach is just fine, and it’s a long and beautiful stretch. Now for the villa itself. 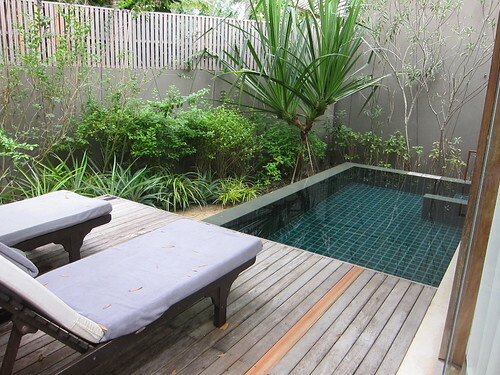 We booked a pool villa. They somehow designed it so that it had a touch of both modern and traditional. Check out the entrance. The villa was beautiful, with plenty of well-planned touches, like unobtrusive lighting and a high fence outside for privacy. 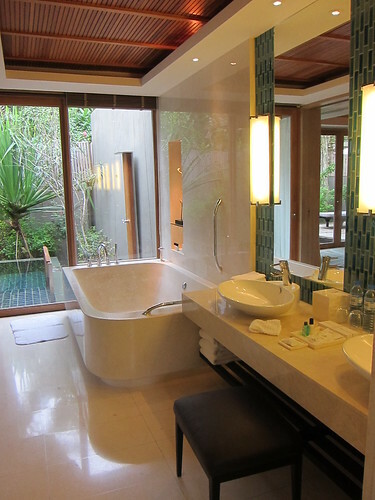 The villa was essentially one extra large room divided into sleeping and bath areas. Look at the pictures to see how pretty they are. I loved the stone bathtub the best, it was huge (and takes forever to fill up) and when the pool was too cold (which was most of the time), we soaked in the tub instead. 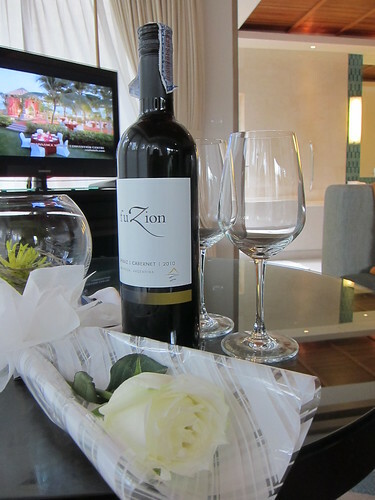 The hotel also gave us a complimentary bottle of wine (which unfortunately gave us both a terrible headache) and a rose as we told them ahead we were celebrating a special occasion. That was a lovely touch. They also provided afternoon snacks in the room. 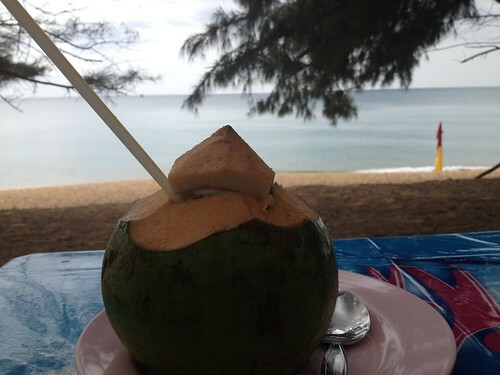 We had cake pops one day, complete with chocolate dipping sauce and coconut shavings, and local snacks another day. 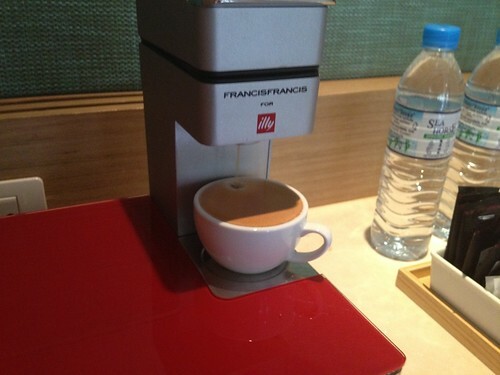 There was also a fancy espresso machine in the room, so we could have a cuppa any time we wanted. They refilled the pods every day too. Now for the pool. It was the first time I stayed at a place with a private pool and it was such luxury to lie in bed or lounge on the couch while enjoying the view of the pool. We didn’t really use the recliners outside because it was far more comfortable indoors and I was afraid of being bitten by mosquitoes. The water in the pool was pretty much always cold, probably because the villa was quite shaded for much of the day.. It was more comfortable to swim at the beach, but nice to have a cold dip before going into the shower. 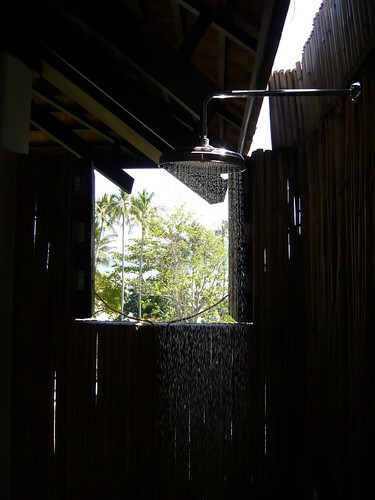 There’s a nice outdoor shower for rinsing off before and after a dip. 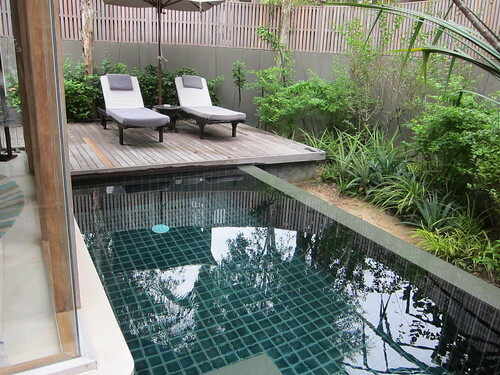 The best part really is to draw a hot bath, have a dip in the pool and then run inside for a soak. Mornings found us hanging out at the breakfast buffet which was part of the room rate. 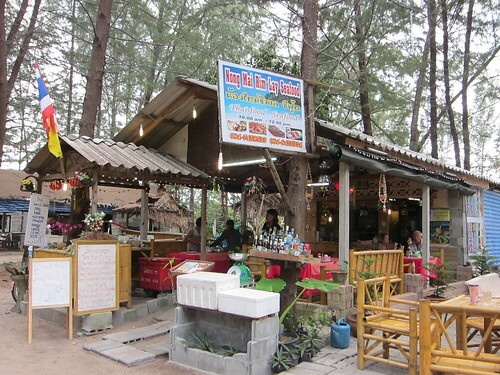 It had a really good spread, with local favourites changing every day, like green curry fried rice or pad thai. There was the usual assortment of bread and baked goods with spreads like honey on the comb. There was a juice bar with plenty of freshly squeezed choices. We went to town ordering green apple and ginger, then pear and dragonfruit, pineapple and celery, and all other combinations in between. There was satay and Caesar salad, eggs made to order, rice porridge with plenty of toppings and so many choices that three breakfasts were hardly enough for me to feel that I had sampled it all. The waffles are worth trying, mainly because of the banana, kaffir lime and coconut topping and the yummy home made ice cream you can have on it. One tip about breakfast – make sure you sit inside and bring a cardigan if you feel the cold. The airconditioning inside is quite strong, but it’s definitely better than being outside with the flies. This seemed to be the case every morning and nothing seemed to be done about it. It’s fine in the afternoon when we had an ice cream outside – no flies then. 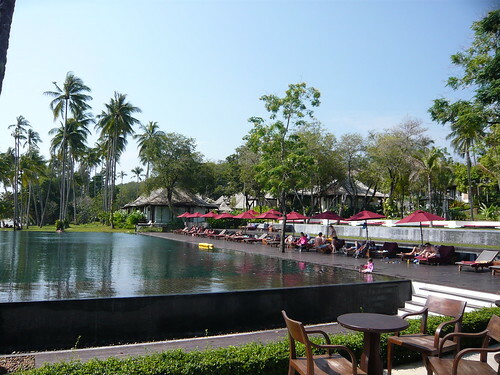 We spent much of our time in the resort and tried most of the restaurants and cafes. Unfortunately, the Thai restaurant was disappointing as the flavours were off-balance. Later we realised that the kitchen was helmed by a Caucasian chef – what a travesty considering that there is definitely better talent right there in Phuket! 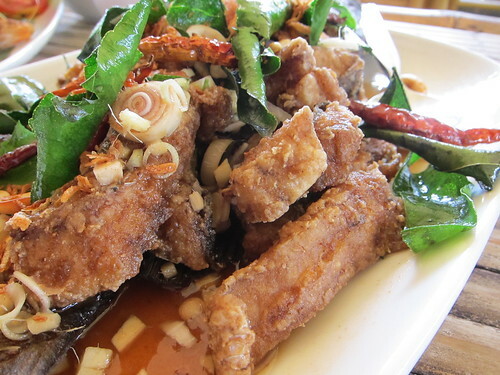 For authentic Thai food, we ordered in from the nearby Kin Dee restaurant. The other places serving Western fare were decent, just be prepared to pay resort prices. Overall, it was a lovely experience, with charming and friendly staff. They would ask if we wanted a buggy ride even though it was but a short walk to the villa. I was also very impressed by how they managed a fussy guest very well. He walked away happy. We walked away happy too. It was a lovely experience with good service as advertised. And one of the best things about this place? Sunset at the beach while lounging at the main pool. 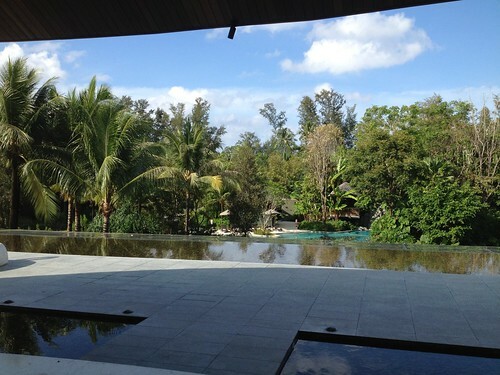 The Vijitt has a beautiful infinity pool to match its beautiful grounds. We admired it every morning at breakfast and had a dip a couple of times. Too bad it wasn’t quite as good as the diving the past week! Food at the resort was very good. 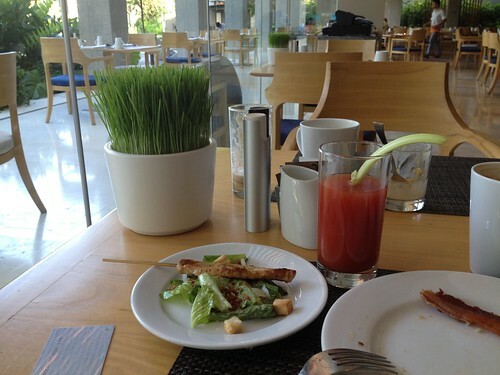 I liked the breakfast, the buffet spread was decent and they provided fresh juice to order. DC, however, has higher standards. Good thing the a la carte menu for dinner met his standards! There were two restaurants inside, one the main restaurant looking out at the pool and the other an intimate Thai restaurant in a beautiful house facing the beach. It was this restaurant that had fabulous food. I liked how refined the cooking was. 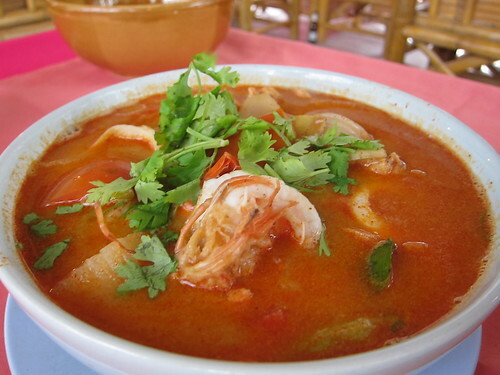 Here we’ve got a delicate soup that tasted like a very sophisticated tom yam. It showcased the vibrant taste of fresh herbs and aromatic roots to a T. Didn’t hurt at all of course to have fresh juicy prawns to add to it. The clarity of the flavours was astounding. I’m fairly drooling thinking of it as I type. 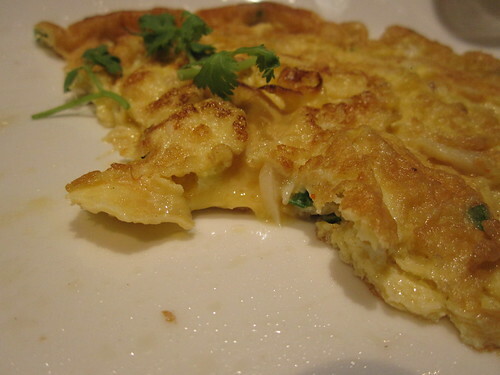 Last dish to feature is the simple yet very skillfully made crab omelette. It was crisp at the edges and still runny in the centre. Of course, the crab was fresh and sweet. It was such a satisfying counterfoil to the rest of the dishes. I could eat here every day! After all that hard work diving, a couple of days at a nice villa was definitely in order. DC found the Vijitt Resort online based on its reputation. 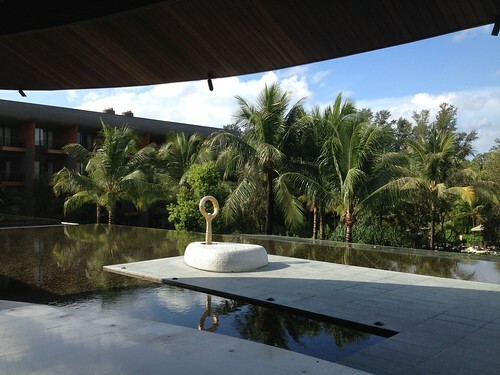 It didn’t hurt that the place appears in Francis Ford Coppola’s list of top resorts in the world. and what a beautiful place it was! 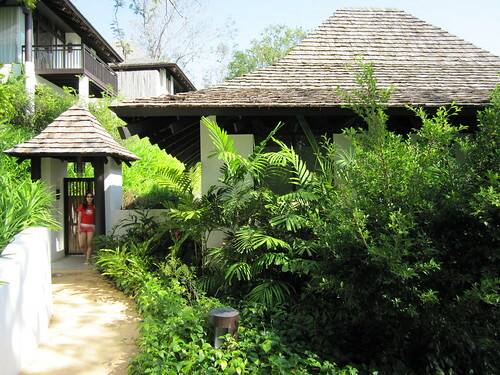 The resort only has individual villas, there aren’t any rooms in a building. Each had a private entrance and a little garden filled with aromatics. 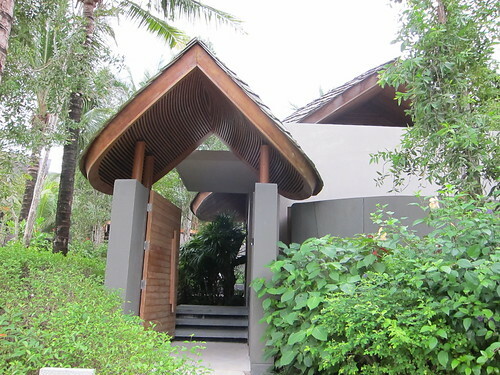 I especially liked how they grew a lot of pandan outside our villa. When we emerged for breakfast in the morning, the fragrance was such an uplifting start to the walk to the restaurant. What was even better is that the resort recognises that the grounds are quite big, so there’s a buggy service that takes you wherever you like in the compound. It was great how cheery staff would come up on the buggy and ask if we needed a lift. Most times we waved them off so we could enjoy the walk and the view, but having one at beck and call and also for when the sun was beating down was just fantastic. There were excellent views from the villa. Here’s what we saw from the balcony and bath tub. 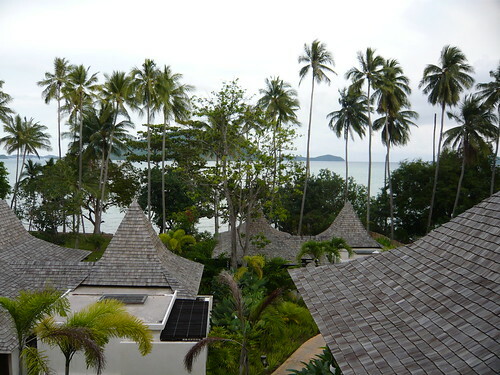 It overlooks the southern shore of Phuket and what passes as its beach. It was incredibly lovely to see the old coconut trees towering majestically over the villas. The resort claims that they built the villas round the trees and not a single one was cut down to build the resort. 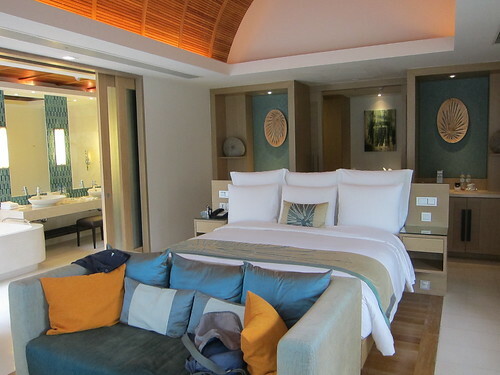 I shall be coy about the room itself, go have a look at the resort website to have an idea of the layout. But what was really nice was the pseudo-outdoor shower. It’s actually sheltered so you’d still need to turn on the shower if it rains. 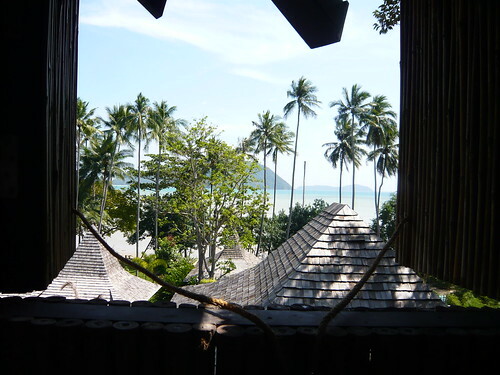 The shower is built in a kind of lean-to bamboo shack with a window that opens out to the lovely view. It was really nice having a shower and enjoying the view at the same time. I liked how thoughtful they were in planning the villas. It’s really hard for someone to peek at you while in the shower, so no worries about privacy. After all that rave review, would I stay there again? Unfortunately, no. It’s mainly because they had a major mosquito problem. 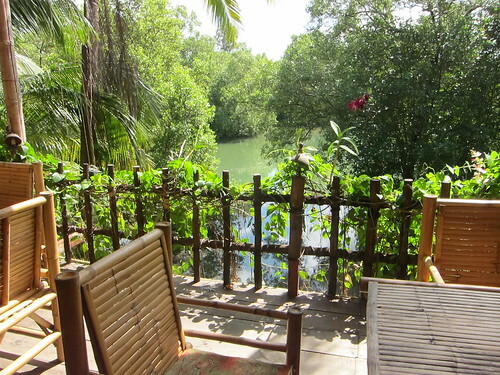 The resort is located in a rather swampy area and despite their efforts to fumigate and place mosquito coils (upon request) in the villa, there was no way of keeping them out. Didn’t we close the verandah door and windows? Yes. We had both airconditioning and fan on at full blast at night but still got bitten. Puzzled by the mystery, DC looked at the finishings carefully and realised that there was a large gap in the sliding verandah doors, so mosquitoes could get in anyway. I was kept up all night scratching, it was that bad. The other problem with the Vijitt is that the maintenance isn’t that great. I think they chose cheap finishings and didn’t do it up properly. For instance, the metal hand grip of one of the sliding doors in the bathroom came off. We realised that even though there were holes for the screws, the panel was simply glued on. Nonetheless, that didn’t affect our stay at all, just that I wonder if the place has longevity. The resort is currently just over a year old and while definitely not run down, it looks like it could do with moreTLC. Please go if you’re immune to mosquitoes, and go soon! 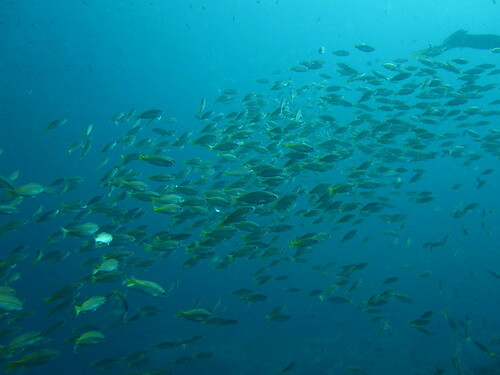 Our last dive in the Similans was at Boonsung Wreck. It used to be a whole boat at the bottom of the sea, but the tsunami lifted it up and smashed it into four big pieces. Ironically, this makes for richer marine life as there’s more space for coral to grow and therefore more places for fish to hide and spawn. 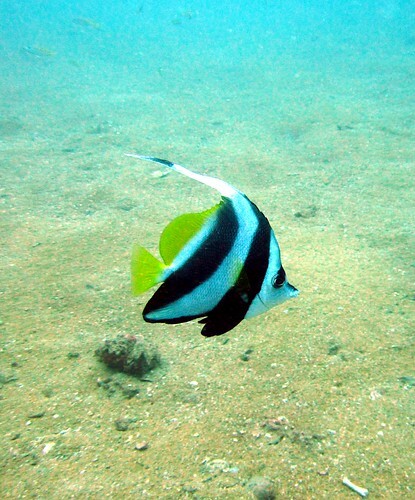 Among which were these bored, listless looking longfin bannerfish mooching about the place. 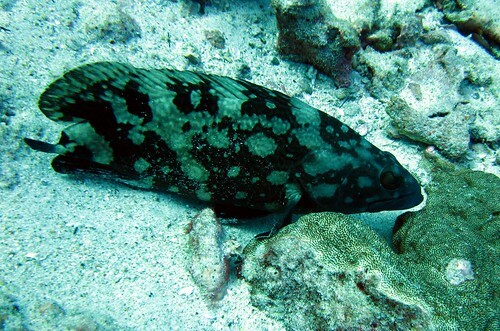 There were quite a few moray eels and here was one of the few blackspotted morays I’ve seen. It wasn’t too pleased with its hole because soon after I took this picture, it departed and tried to fight a white eye moray for space but sadly was soon defeated and had to go back to its lousy old hole. Poor guy. Then there were goby shrimp and their shrimp gobies. It’s cute how all the shrimp does is shovel gravel out of the hole. Talk about a menial task. 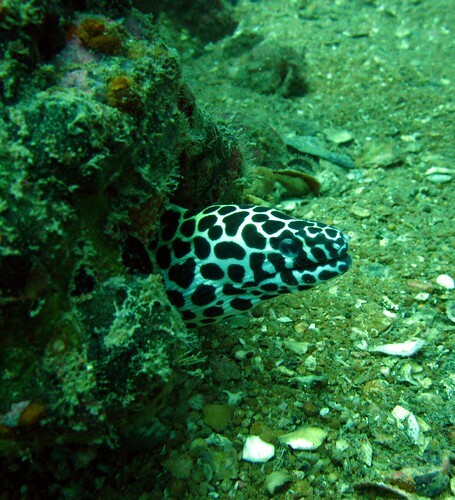 The goby just guards the hole and darts in at the first sign of trouble. 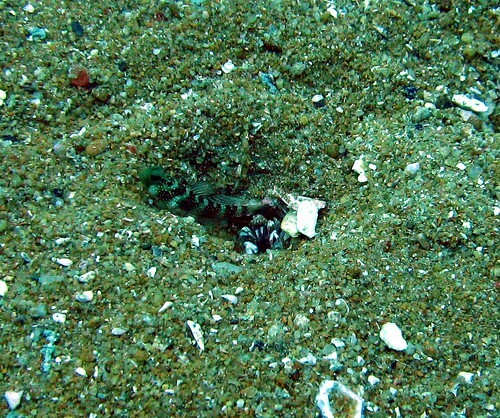 The shrimp never shovels past the middle of the goby’s body. It was so hard to get close enough to take a good picture. This is the best I got. 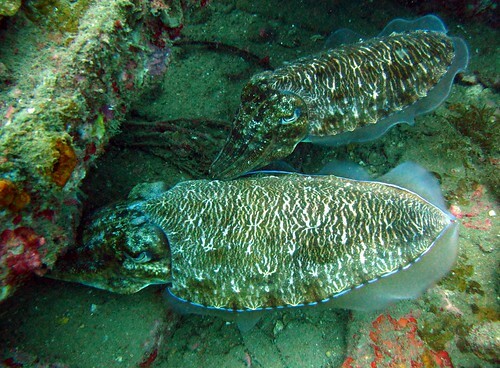 Then there were these two lovebird cuttlefish who stuck together despite showing their alarm colours. I think there were too many divers hovering over them and no crevices big enough for them to hide in. Last of all was the only set of nudibranch eggs I saw on the trip. 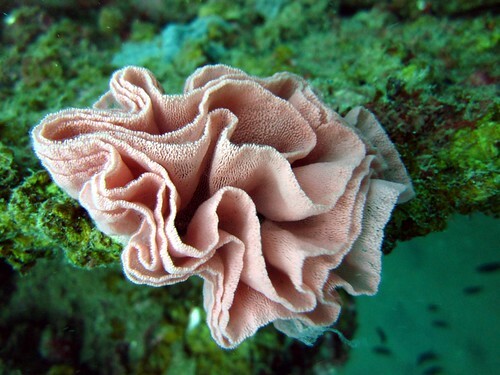 It was funny how there weren’t a huge number of nudibranchs in the Similans. The ones I saw were the rather common and boring ones, so it was such a treat to see the ribbony sheets of eggs. See how each pink dot is an egg? I wonder how these things survive without being eaten by predators, they’re so obvious. Maybe they’re poisonous to most fish. Boonsung Wreck was a nice easy wreck to dive at. While the viz wasn’t the best, I liked how there was stuff both on the wreck and around it. It was a relaxing end to the diving. Several things on the trip made me sad. One of them was the first injured fish I’d ever seen. I noticed this fish being unnaturally still on a sandy area. I thought it odd that somehow it didn’t quite seem alert and did nothing to move away or show that it noticed me when I moved in closer. Then I noticed that there was something wrong with its tail. Looks like it’d been bitten off and the fish was just waiting to die. 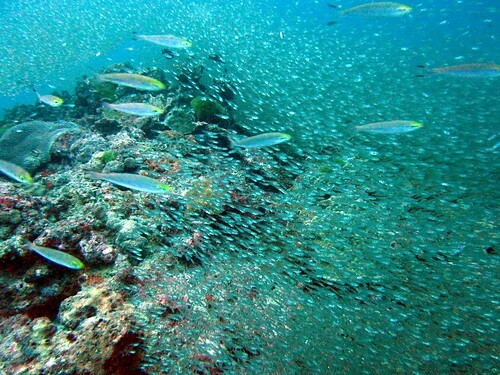 At least it’s natural for fish to get predated upon and go places to die. This sight here wasn’t at all natural and I was upset because our dive guide smeared himself on the sea floor to just for a picture. No doubt he wasn’t lying on living coral, but there are also creatures that live in the sand and they have equal right not to be disturbed like that. 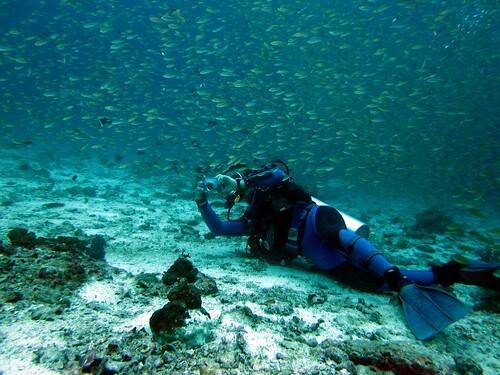 Especially not when their homes cave in when a diver lands smack in. At least the schools of fish made me happy. Just watching the fish soup swirl past put me in a better mood. Doesn’t it do that for you too?